Despite the fact that women are who usually get personalized gifts, men also like them and there are some that are specially designed for them. Personalized gifts for men are perfect for every occasion no matter it is Christmas or his birthday; you just have to find the right one. Here are some of the most popular choices when it comes to buying the perfect gift for him. Gifts that show how much you appreciate him. Here where you can find gifts that have a text like “Father of the year” and it can be on cups, t-shirts, sweatshirts and also diplomas. Also, t-shirts can be personalized with pretty much every text you want so you can always get one of his favorite sporting team and just put his name on it. Since we are talking about clothing, you can even get a sweatshirt that has a special pocket where he can perfectly fit one bottle of beer; one of the most practical gifts for him. If he doesn’t like drinking from the bottle, why not get a personalized beer mug? And as we all know that a cold beer is better than a warm one, you can consider getting a little beverage tub with a stand; you can even have his name on it. Moving on to funny gifts such as a warning sign for the garage where he spends his time with his friends. A doormat can have the same effect while being more practical. Other personalized gifts can include a pocket knife with his initials on it. This is a great gift if he loves spending time outside because you can always find something to do with a small knife. A grill set and a chef uniform with his name on it would make for a great Sunday barbecue with family and friends. 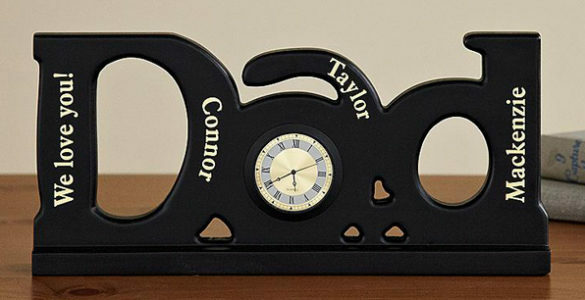 You can also think about buying him a new watch and have a personal message engraved on the back; this is usually done for special events such as an anniversary. Another fashionable and personalized gift can be a gold plated money clip with his initials one it.